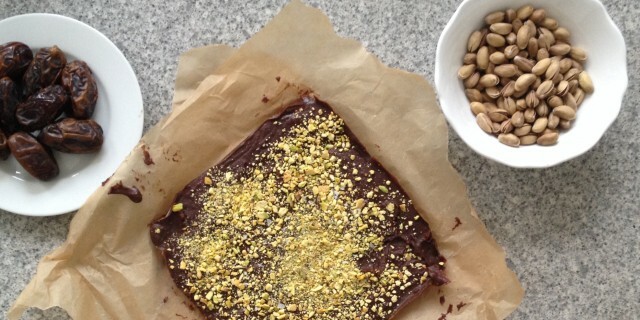 This dairy-free Espresso Date Chocolate Fudge with pistachio nuts is rich and decadent and very easy to make. It requires no baking and combines all my favourite flavours: the intensity of dark chocolate, the richness of a strong espresso, the spiciness of cardamom and cinnamon, the soft, chewy caramel-like flavour of o fresh Medjoul dates, the nuttiness of pistachios and the salt kick of the sea salt flakes. Choosing the right coffee is an important element as the dates need to marinate in the espresso with the spices before adding them to the chocolate base. As I don’t own a coffee maker, I got my shot of espresso (Two for Joy) from Cottoncake. It has a strong, rich flavour. The marinated dates, including the shot of coffee, are processed in a food processor until you have a smooth fudge-like consistency. When added to the chocolate base, you get a beautiful thick chocolate fudge with an intense, rich and spicy flavour. The flavours of the Middle-East combined in a wonderful, sweet chocolaty treat. It’s rich, decadent, moist, melt-in-your mouth chocolate fudge. Add the chopped dates to a small bowl. Add cardamon, cinnamon and vanilla and pour hot espresso over the dates and let sit for 20 minutes. When ready, process in a food process until you have a smooth, buttery consistency. Melt the cacao butter au bain-marie. Add the cacao powder, the agave nectar and sea salt. Add the date coffee mixture slowly into the chocolate mixture. Pour the mixture onto a nonstick baking tray, lined with baking paper. Sprinkle chopped pistachios and some extra sea salt flakes on top, and let set in the freezer for an hour before serving.